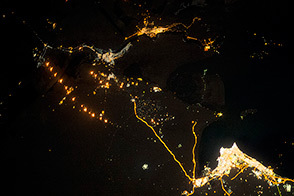 The images above were acquired by the Moderate Resolution Imaging Spectroradiometer (MODIS) on NASA’s Aqua satellite on February 19, 2014. 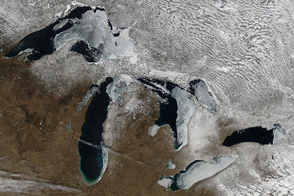 The first image shows the Great Lakes in natural color in the early afternoon, when ice covered 80.3 percent of the lakes, according to NOAA’s Great Lakes Environmental Research Laboratory. 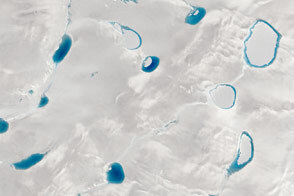 The second, false-color image uses a combination of shortwave infrared, near infrared, and red (MODIS bands 7-2-1) that helps distinguish ice from snow, water, and clouds. 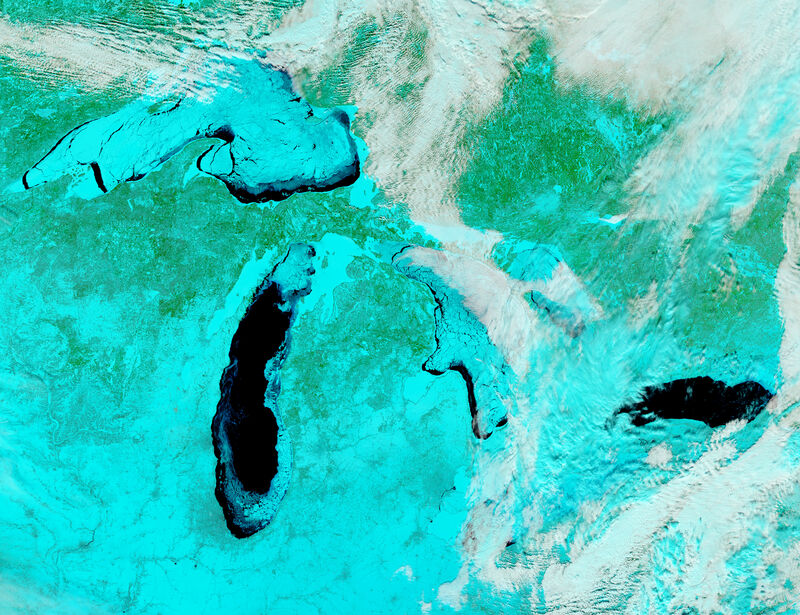 Ice is pale blue (thicker ice is brighter), open water is navy, snow is blue-green, and clouds are white or blue-green (depending on temperature and composition). 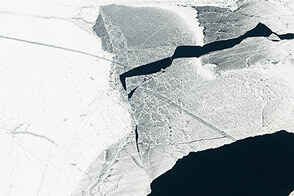 The frozen lakes have implications well beyond the water surface and the winter. 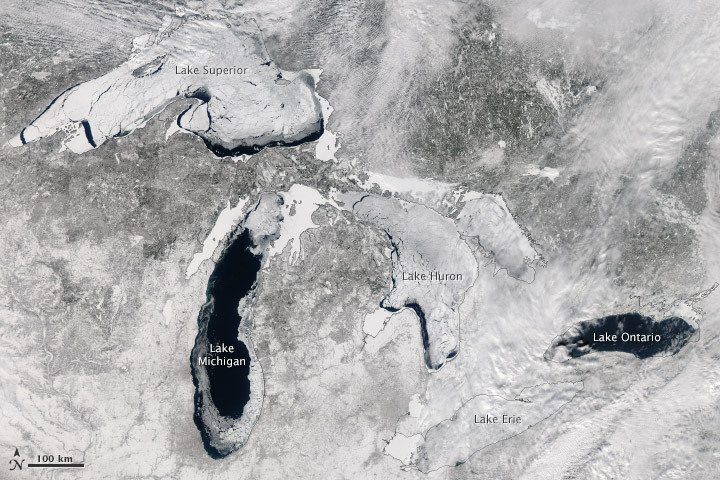 Extensive ice cover on the Great Lakes can change the patterns and amounts of the famous “lake effect” snowfall in the region, explained Walt Meier, a cryospheric scientist at NASA Goddard. When the lakes are mostly ice free, cold west or north winds blow over the warmer water, pick up moisture, and then drop snow on the lee side of the lakes (usually eastern and southern shores). 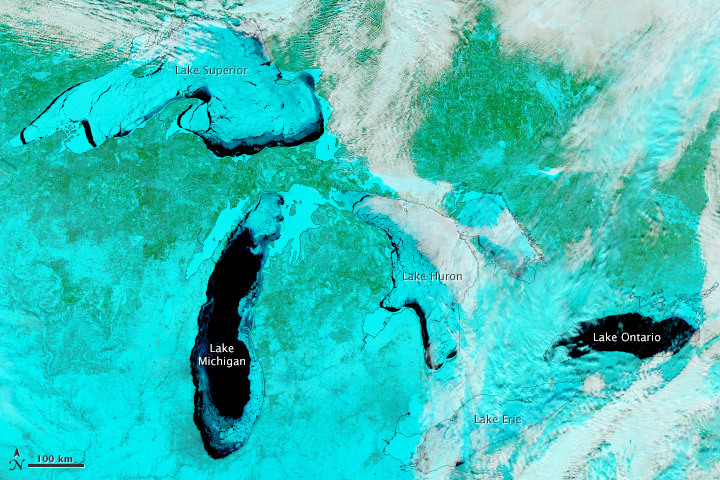 When the lakes freeze, the effect generally shuts down. However, the region is still receiving a fair amount of snow this winter due to other weather patterns, Meier noted. Lake levels could be affected in the summer. 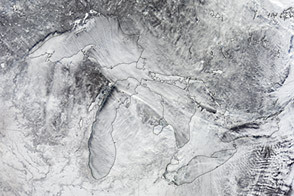 Winter ice cover generally reduces evaporation during winter months. If that turns out to be the case in 2014, it would be “good news for local water supplies, as well as for shipping and recreational use,” Meier said. 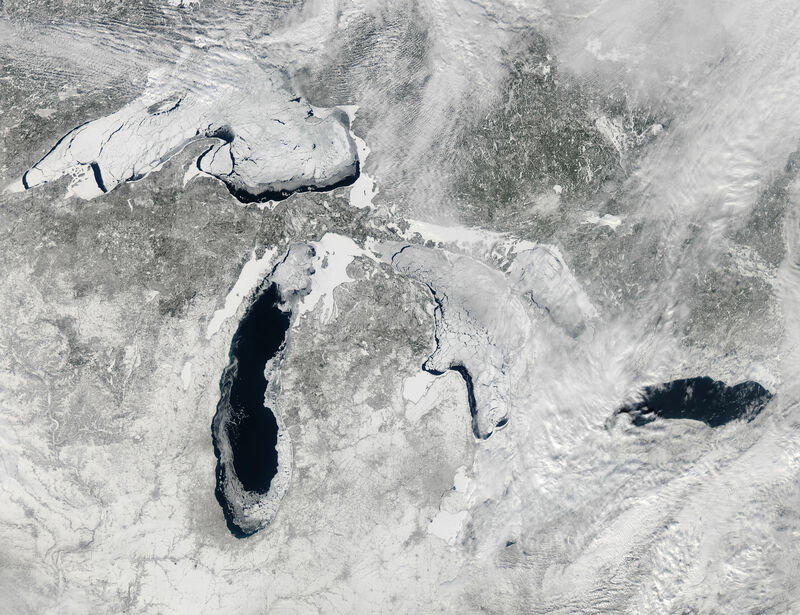 A 2012 study published in the Journal of Climate by scientists from NOAA’s Great Lakes lab found that winter ice cover on Lake Superior decreased 79 percent from 1973 to 2010. 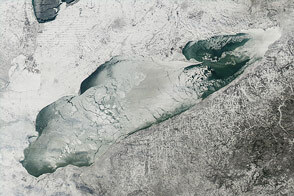 The study also showed that ice cover on the lakes is highly variable and difficult to predict. 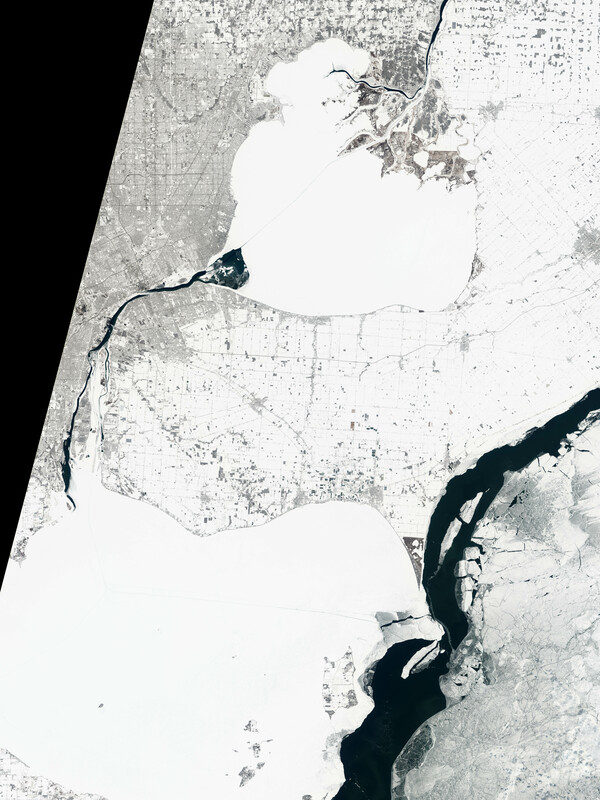 You also can view images of Great Lakes ice cover on February 15 and February 16. 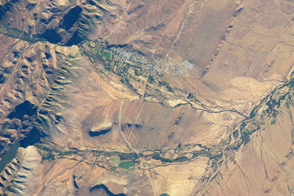 Aqua MODIS images courtesy Jeff Schmaltz, LANCE/EOSDIS MODIS Rapid Response Team at NASA GSFC. 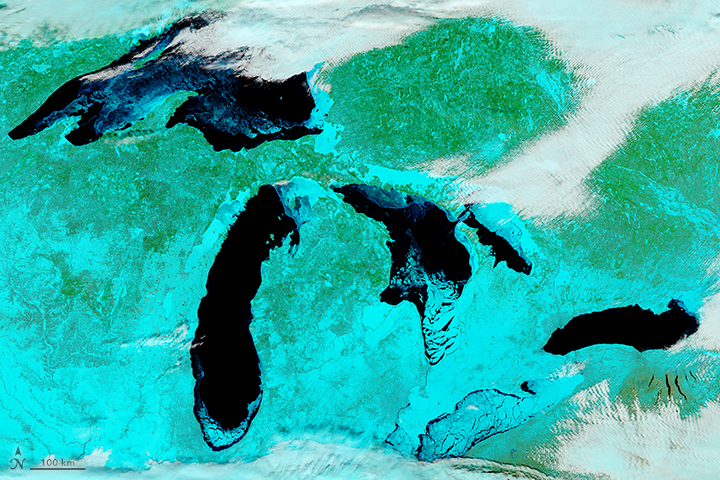 Landsat image by Jesse Allen and Robert Simmon, using data from the U.S. Geological Survey. Caption by Kathryn Hansen, NASA’s Earth Science News Team, with Mike Carlowicz. Ice cover surpassed 80 percent for the first time in 20 years. 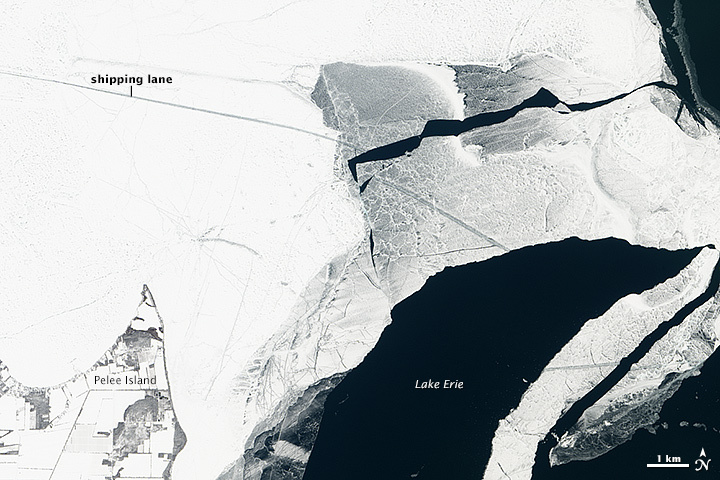 Associated Press, via Yahoo News (2014, February 14) Great Lakes become nearly covered with ice. Accessed February 20, 2014. Environment Canada Current Ice Conditions and Forecasts. Accessed February 20, 2014. 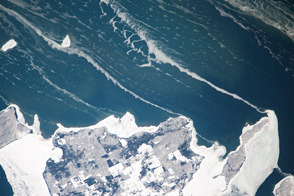 NOAA Great Lakes Environmental Research Laboratory Great Lakes Ice Cover. Accessed February 20, 2014.